For some reason every time I hear there is going to be a car seat special on TV…. I slump my shoulders and my first instinct is to ask myself: Do I really want to watch it? Can I bear it? That might sound odd and possibly you might think that I’m too full of myself, criticising these things that make it to TV. Surely they are being covered by experts with far better experience than me right? This is true, though I personally look at myself as extremely knowledgeable in my field and do get a lot of positive feedback. Most of the time I don’t actually have a problem with what the selected expert(s) have to say because they are rarely wrong. It’s more about what I feel they should have mentioned more, if at all. I do happen to know a very good expert on a personal basis that I have the utter most respect for in this profession who has been on TV and works very hard for rear facing awareness. I spoke to her about her last performance on the telly and I remember she told me that she *tried* to mention ERF to “shoot it in” somewhere, and it was actually cut out of the program! So she shot in that it’s important to use the seats to the max, including the rear facing limit of your car seat. When such a thing happens I start asking myself what the producers are really aiming for? Can I trust what they are saying? Because for all I know there was a tonne of more info that they just didn’t feel “fitted” in. All in all, I actually thought it was good, straight to the point, and it showed us the errors of the selected major high street retailers (this is why I advise everyone to use a *Specialist* retailer). Watch the episode yourself here and see what you think, tell me about it in a comment below? First things first, the opening scene…..
It’s not ideal is it… can you spot what I spotted about 3 sec into him putting the child in the seat? If not, fear not, I shall put you through it. George’s car seat headrest is too low for George’s height. This is forcing the harness to dip below his shoulders and is most likely also one of the reasons why reason nr 2 is there. The car seat harness is not correctly fitted on the child. The straps are falling off the shoulders and are quite loose. This is probably due to problem 1. George has been given a book that is ‘hardback’. Picture that book being thrown into his or other passenger’s face in the event of a crash – weighing as much as a house brick… It’s not good. And it should never be in the car while driving. 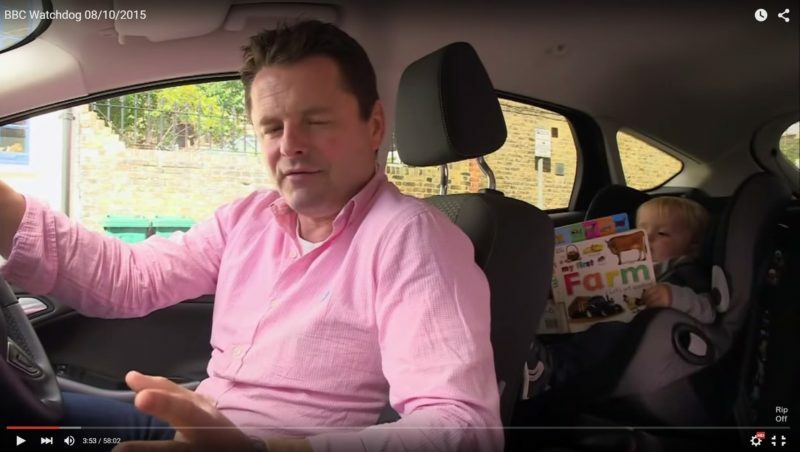 I also want to point out that even though it is fully legal, little George is far safer travelling in a rear-facing car seat. I feel that if you’re already starting the program doing it all *wrong* that can be good or it can be bad. I choose to think that in this case because this episode is all about wrong advice and how we are failed by the retailer selling us the seat, this might actually have been done on purpose. Maybe Chris Hollins really didn’t know. Maybe he was one of the too many parents who just didn’t know that this was the wrong way to put his child in the car seat. I wouldn’t surprise me if the answer is yes, especially when they show us the horrid experiences they are having when buying a seat! My advice would be to fix it the moment your child is set to go in the car again! The headrest is at the correct height so that the harness is coming from just at or just above the shoulders on George. Make sure to never use any heavy coats in the car seat (it is getting colder now), instead use a fleecy jacket and simply put a blanket over him after the harness is buckled up. Make sure the harness is correctly placed on George’s shoulders, that the harness is nice and snug – you should only be able to fit a finger between the harness at his collar-bone. Crash testing of wrongly fitted sets on BBC’s Watchdog from Therese on Vimeo. To be honest I find it quite disturbing, not to mention disgusting to watch. To think that a “trained fitter” at a *retailer* secured the car seat in the car like this!! And would have had you drive home with your seat and your child secured in the seat LIKE THIS! And the excuses? Oh, don’t even get me started… the SAME excuses I read LAST TIME this was investigated! I just see the same old excuses… and frankly, it pisses me off! That high street retailers need better training and give horrid advice more often than they give good advice, is something most people are aware of on Facebook. If you only took a look at a daily basis in our car seat advice group and plunked that into the yearly numbers, I’m sure it would show horrific results. It’s not the fitter’s fault, she or he just works there. It’s obviously the management and HQ’s fault. It’s not like you should require your car seat staff to have proper advanced car seat training, expect them to do research on their own free time and not be 100% dependant on what your seasonal baby catalogue says right? [yes that was sarcasm]… am I seriously grasping at straws that hard to expect this?? You are putting a child in danger when you do not train your staff correctly and keep them up to speed! 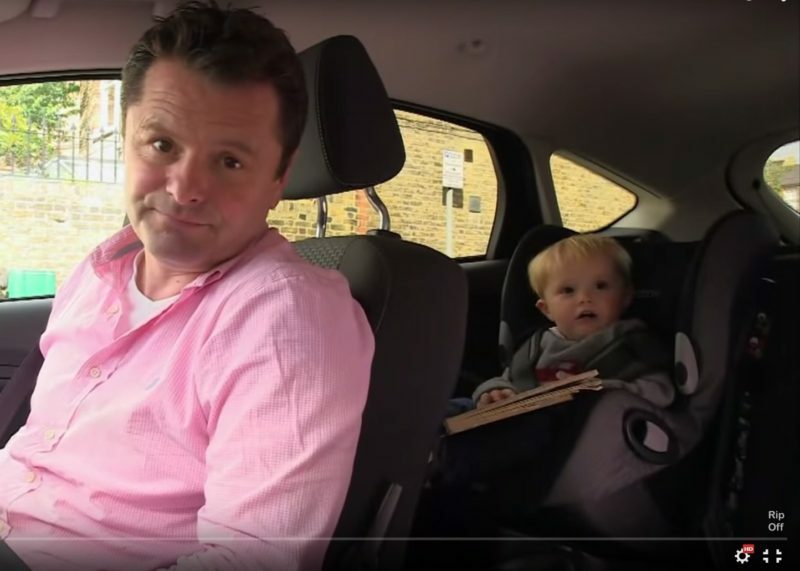 And in this small test Watchdog did, we’re talking about the shop’s own brand car seat! How can you not know how to fit the car seat?! – No wait, I wouldn’t call a few of those “fittings” even a fitted car seat! It’s absolutely terrifying to watch!! And it’s not only when you go and buy from them. I have done a few mystery shopping trips myself into high street shops to see what I’ll be told. You can read about my trip to Mothercare HERE. Good Egg Car Safety does FREE car seat checks all over the UK, and we experience quite a few bad fittings, some have even come straight from a retailer! Today’s figures, which are based on checks of over 10,000 child seats across England, Scotland and Wales carried out by Good Egg, show a rise in unsafe fitting from 47% in 2010 to 55% in 2011, 57% in 2012 and 60% in 2013. Child car seat checks conducted in Hull this week by Good Egg Safety in conjunction with Hull City Council underlined the unacceptable risks to children from badly fitted car seats, with 77 per cent failing the checks. Car seat fitting checks conducted last year in 2013 in the same location, showed failure rates of up to 90%. Whilst this is an improvement year on year, the current results reflect a national pattern where just one in three child car seats are found to be safe. The Hull tests this week were reported on by ITV news. The situation in Hull was/is so bad that it was even covered on iTV! Watch it HERE. It was also covered by HULL DAILY MAIL. So what do we do? How do we change this pattern? I’m very familiar with parents stating that; the car seat they have in their car was fitted by a retailer and therefore it was indeed fitted “correctly” when I notice an incorrect fitting seat. What does this tell me and you? It tells us how much trust that parent put into the person who fitted his/her car seat. And why wouldn’t they? Surely this fitter has been trained? Surely to be allowed to work in a shop that sells car seats they know about car seats and all that comes with it, right? And they should be able to trust the person! But as it is at the moment, I’m always hesitant to even recommend using a high street retailer unless they are on the Good Egg list of approved retailers. Or are ERF specialist retailers because let’s be honest, that’s where I mostly direct people with young children & babies. But I would love to know your own thoughts on the subject so leave a comment and let’s discuss! ← I am humbled beyond measure! Finalist Blogging Edge 2015 UK Blog Awards! If you enjoy my content, please consider supporting what I do by buying me a coffee. Thank you!